Full-featured compact and efficient benchtop dispensing robot offers accurate and repeatable dispense results. GRAND JUNCTION, CO USA ― February 2018 ― GPD Global introduces its NEW full-featured benchtop dispensing robot system: Catalina. A benchtop system does not mean "no features". This compact and efficient semi-auto dispense robot provides you with numerous standard features: automatic vision, laser surface sensing, and automatic nozzle alignment and calibration. Some companies require a small and economical dispense system to meet their dispensing requirements - Catalina was developed with this in mind. This powerful and compact dispense robot is easy to learrn with its computer-based software with Windows operating system. Applications using conductive adhesives, solder pastes, glues and gasketing, and more benefit from this compact and full-featured table top dispensing system. Programming is done via computer. User-friendly graphic editing allows users to effortlessly create a dispense path. For complex path programming, AutoCAD DXF files can be imported. 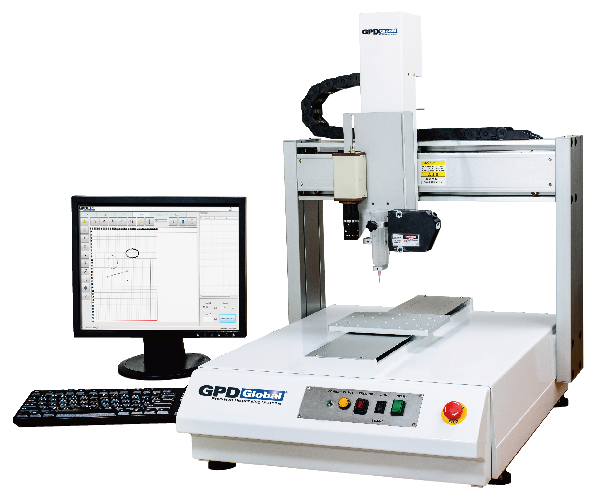 For uneven surfaces, the system can use the laser to trace a dispense path for automatic dispense height adjustment. Catalina is a semi-automatic table top dispense robot system that is compatible with GPD Global's full line of dispensing pumps: Precision Auger, NCM5000 Jetting, Volumetric PCD, and Time Pressure. A pump is available to suit your fluid type and dispense requirements. Speak with our specialist about your dispensing requirements: contact 970-245-0408 or request@gpd-global.com. See live demo of this impressive full-featured benchtop system at IPC APEX 2018 - Booth 3325.